These are really good – try on a barbecue as well as in the kitchen. The satay (peanut) sauce is a great staple too and is fantastic with lots of other dishes, such as stir-fries and rice or noodles. However, if you're in a hurry, here are some ready-made brands that just happen to be vegan! Sainsbury's; Thai Taste; Yeo's (other brands may contain fish or shrimp sauce). 1. If cooking tofu from scratch, mix soya sauce, water and garlic in a bowl. Toss tofu cubes in mixture and set aside. Marinate for a minimum of 2 hours or ideally overnight. 2. If using wooden skewers, soak in cold water (this stops them burning under the grill!). 3. Pre-heat grill to medium. 4. Assemble satay sauce ingredients in a pan. Mix together until smooth and warm gently until thickened. If too thick, add more hot water but adjust seasoning to taste. Keep warm but not boiling. 6. 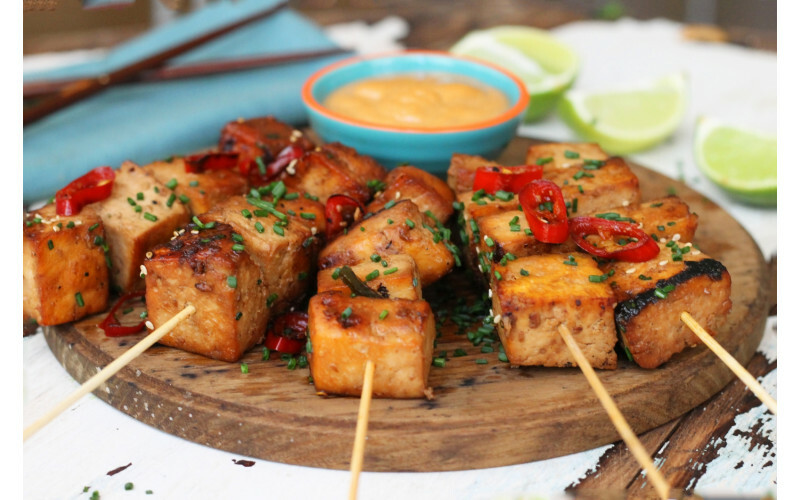 Thread the skewers with alternative pieces of pepper and tofu. Brush with a little oil or squirt with oil spray. 7. Cook under the grill for 5-10 minutes, turning regularly to stop the kebabs from burning. Serve with hot satay sauce. * Any left-over marinade can be kept and added to soups, gravies or stir-fries.